Are you on a treadmill of “to-do’s” that never come off your list? So is everyone else, and Brigid Schulte wants to figure out why. 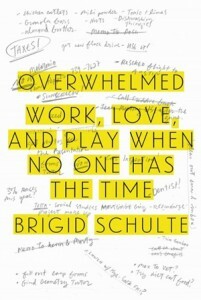 Her new book, “Overwhelmed: Work, Love, and Play When No One Has the Time,” is a must-read for those of us who struggle with managing our own time, yet cannot pinpoint how to begin to correct the problem, or how our time struggle even began in the first place. The book examines, in-depth, why so many of us are having trouble with managing time — including what societal factors or personal habits are limiting our success. 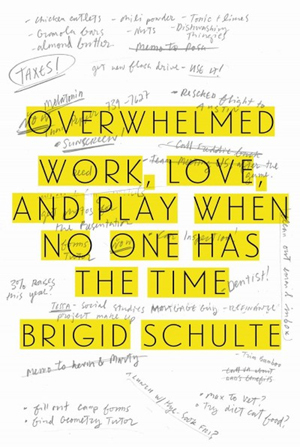 Weaving a story of feeling overwhelmed across different facets of modern day life — work, love and play — Schulte focuses on the ideas of “time confetti” and “time serenity” as a way to explain the problem of feeling like there are never enough hours in the day to get things done. The book is a mix of research notes, studies, public politics/political motives, interviews, anecdotes and the author’s own first-person account of how this country has become overwhelmed. The book points out traps that we all fall into and provides some real-life examples of how to cope with or avoid the traps. If you want to figure out why you are feeling so overwhelmed in your daily life, and how to fix it, this is your read. To read more reviews by Molly Ford, visit SmartPrettyandAwkward.com.